The McDonnell Boeing (formerly Douglas) AV-8B Harrier 2 N/A (NightAttack) is a night attack variant developed out of Harrier line of planes. Unique to the Harrier series of planes is despite only featuring a single central engine, it can be used for both forward and VTOL flight, courtesy of the 4 nozzles positioned on the sides of the aircraft fuselage that can be rotated on pilot command. This allows the Harrier to flexibly operate from all manner of airfields (the Harrier can also take off in a conventional manner from airfields) and carriers: Harriers will typically operate from STOVL class carriers that only feature a flat deck and no further carrier implements (ramp, catapult, arresting wires). 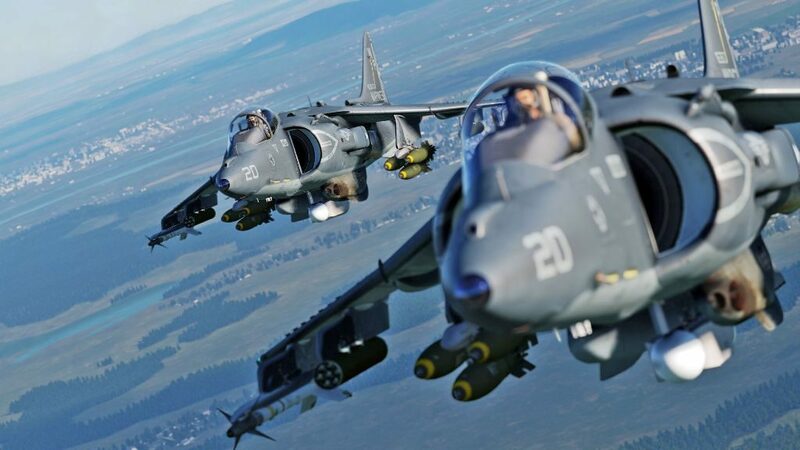 The Harrier does not require these as it can take off and land vertically: however, with any meaningful load (stores, fuel tanks) on the aircraft it will typically perform a rolling takeoff / landing instead. The AV-8B Harrier N/A is tailored specifically towards the attack / strike role, allowing for quick attacks thanks to the high speed it can attain in forward flight. Despite the relatively small size of the Harrier it can carry a good amount of ordinance and it has a slew of sensors built into the aircraft, including a sensor package mounted on the nose contained a FLIR (Forward Looking Infrared) sensor combined with a normal video camera that can detect objects, lock onto laser designations and provide relevant targeting information for weaponry. The AV-8B can also bring the AN/AAQ-28(V) LITENING targetting pod on one of its stations to provide its own laser designation, in addition to providing a larger azimuth range in which the sensor can be slewed. This extensive sensor package allows it field a whole slew of both dumb and smart weapons, such as the Mk-82 bomb and its laser counterpart the GBU-12/-16, the AGM-65 Maverick anti-tank missile with CCD/IR/Laser guidance seekers, 7 inch FFR rockets in rocket pods, AIM-9 sidewinders and the AGM-122 SideARM anti-radiation missile for short range SEAD / DEAD (attack of radar-guided SAM sites). This page was last edited on 3 March 2019, at 21:38.